The world of rare and numismatic coins can sometimes be a tricky one to navigate if you don’t know what to look for. Before we get into that, however, let’s define numismatic coins. When we say “coins” we’re referring to collectibles with numismatic value over their face and melt value. These coins are numismatically interesting, rare, have nice eye appeal, or come with fascinating stories. They aren’t the coins in your change jar. As such, these are coins that are valued for their rarity and their precious metal content, and they’re typically not minted anymore, so the supply is limited. The cut-off for numismatic coins is generally 1933, the year in which President Franklin Delano Roosevelt banned gold ownership and production of these coins ceased permanently. Furthermore, these coins are collectible and typically have historic value. For a coin to be numismatic, its retail price must be double the value of its metal content. 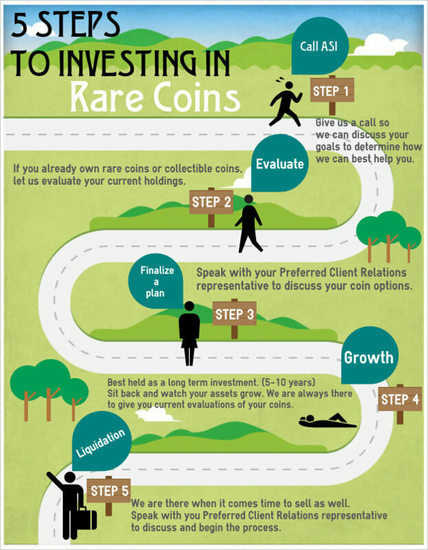 When purchasing these coins, we suggest holding onto them for at least five years for you to get the most out of your investment. As the name implies, there’s a great deal of variety among numismatic coins. There are several ways to invest in these coins, including by date, denomination, grade, mintmark, type set, and so forth. In addition to rare U.S. gold coins, there are also two commonly collected rare U.S. silver coins: the Morgan Dollar (1878-1904, 1921) and the Peace Dollar (1921-1928, 1934-1935). Altogether, these numismatic coins run the gamut when it comes to rarity and condition, which brings us to our next topic: grading. Does Your Coin Make the Mark? A coin’s rarity is also influenced by the location at which it was minted. Coins from some branch mints are oftentimes rarer or more popular than others due to historical significance, number of coins produced at the specific mint, and the duration of the mint’s operation, among other factors. For example, San Francisco and Dahlonega gold coins are typically the most popular due to their connection to gold rushes. Moreover, Carson City gold is often rarer than gold produced at other mints, as this location produced mostly silver, thanks to an outpouring of silver from the Comstock Lode. I’ll Take One of Everything, Please! The Basic 8-Coin Set: Easy to assemble and reasonably affordable, contains the four Liberty designs (Quarter Eagle, Half Eagle, Eagle, and Double Eagle), the three Indian designs (Quarter Eagle, Half Eagle, and Eagle), and the Saint-Gaudens Double Eagle. 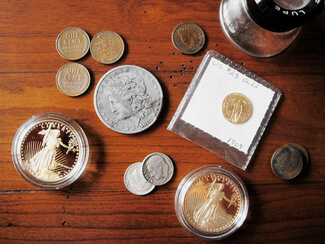 The 12-Coin Set: The basic 8-coin set plus the three designs of gold dollars. The 14-Coin Set: The 12-coin set plus the “No Motto” $5 Liberty Half Eagle and $10 Liberty Eagle. The 36-Coin Set: This is the ultimate set and contains all major types struck from 1795 to 1933. When it comes to investing in rare and numismatic coins, there’s a lot to consider before making a purchase. Like any investment, it’s generally better to go in with a plan and know the value of your investment. With so much variety in the numismatic marketplace, you need to be informed. If you’re interested in receiving exclusive Coin of the Week offers or early access to our monthly Spotlight offers, please subscribe to our Numismatic Navigator newsletter to be the first to hear about special numismatic offers. As always, please don’t hesitate to give us a call at 800-831-0007 or email us if you have any questions about investing in numismatic coins.